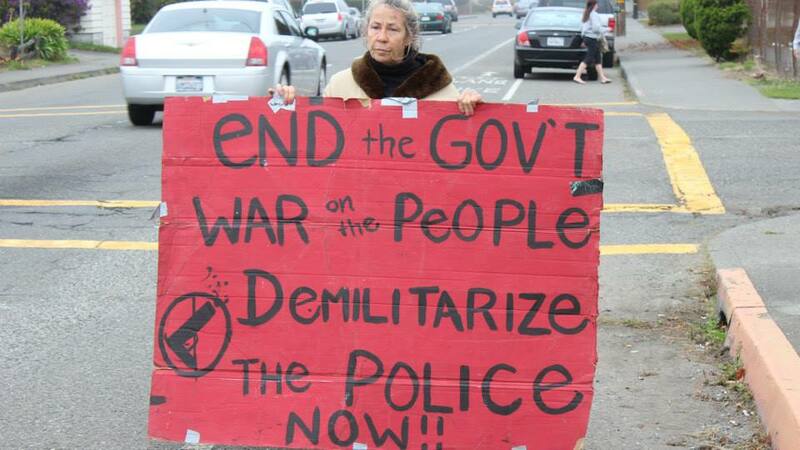 Martin F. Cotton II was BEAT TO DEATH by Eureka Police and Humboldt Sheriff’s on August 9th, 2007. 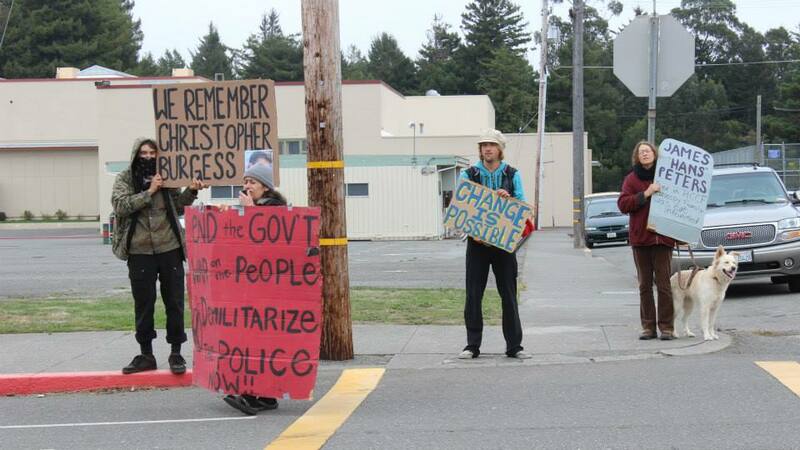 Every year, people gather in Eureka on August 9th to protest the violence of the police, coverups of truth, abusive acts against houseless people, and the insane and cruel behavior of the state toward those of us experiencing emotional or mental crises. Martin Cotton’s death requires us to examine all of these inhumanities. 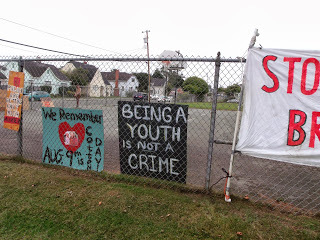 We also gather to remember Martin (or Freddy, as he is also known by many), to honor and support his family, and to share and connect in a good way with other survivors of police brutality and intimidation. Martin’s brutal death was witnessed by many houseless people, causing them great trauma and fear. Speaking out against the violence UNITES and EMPOWERS us. 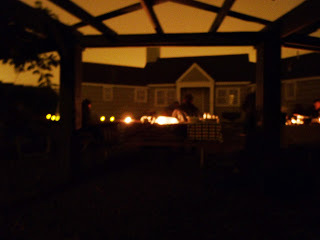 We are learning to defend each other and share healing and strength- so many of us, hurt and frightened. We insist on dignified and compassionate treatment of ALL people. 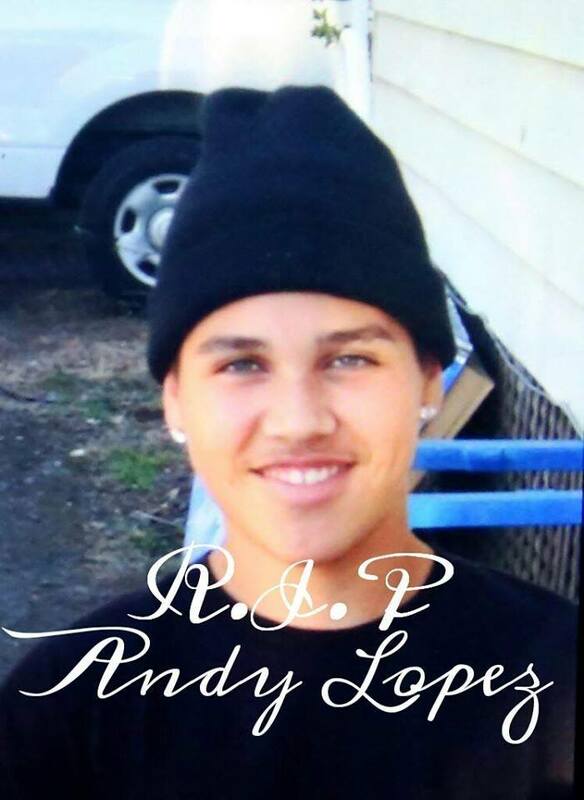 If you can help with food, signs, candles, or ideas, please get in contact. Participate in this protest of police violence, help create a space of honoring and peace for Martin’s spirit and his family, and tell it like it is at the open mic! Expose CalTrans’ lies and misinformation campaign! Monday’s rally will begin at NOON in the Garberville Town Square. Fliers and Handbills will be available Friday Feb 18, 2011! Valentine’s Day Action: Stop Huge Cuts to Critical Housing Programs! Spread the word! February 14th Action!!! The Feds are seriously looking to cut $100 Billion from the already limited housing-related programs! 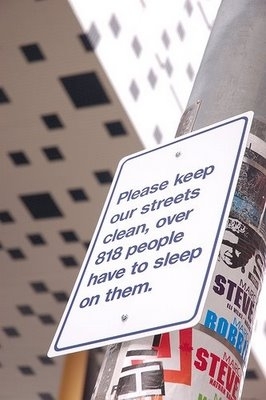 Close to one million Section 8, public housing, homeless, elderly, and disabled people could lose their housing! In solidarity with actions taking place in 25 other cities throughout the U.S., Rally and March in San Francisco this Valentine’s Day! 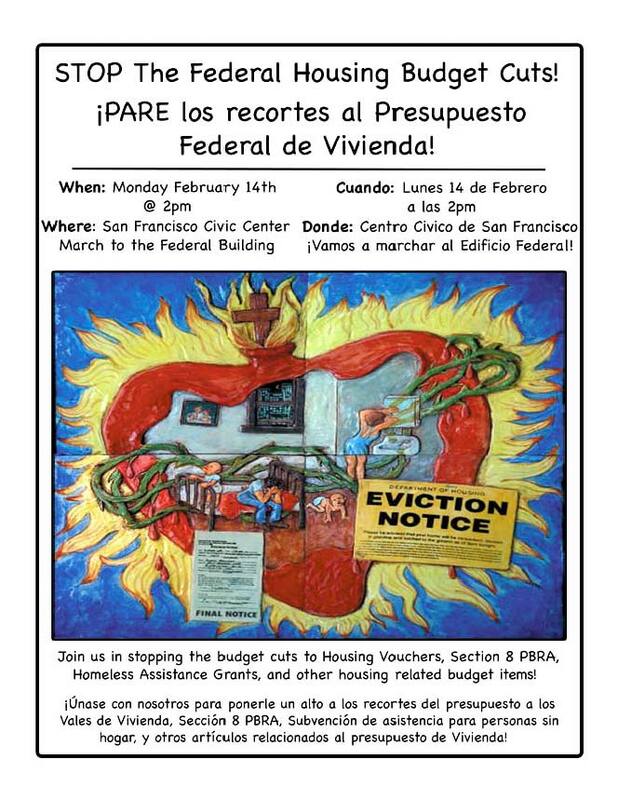 Join us in stopping the budget cuts to Housing Vouchers, Section 8 PBRA (Project Based Rental Assistance), Homeless Assistance Grants, and other housing related budget items! !Unase con nosotros para ponerle un alto a los recortes del presupuesto a los Vales de Vivienda, Seccion 8 PBRA, Subvencion de asistencia para personas sin hogar, y otros articulos relacionados al presupuesto de Vivienda! March to the Federal Building! iVamos a marchar al Edificio Federal! WRAP (Western Regional Advocacy Project), SF Coalition on Homelessness, SF Housing Rights Committee, Causa Justa: Just Cause, Building Opportunities for Self-Sufficiency (BOSS), Homes Not Jails, AIDS Housing Alliance/SF, Council of Community Housing Organizations, and many other housing rights groups. Group Bicycle Ride to Mass Rally at CalTrans in Eureka! 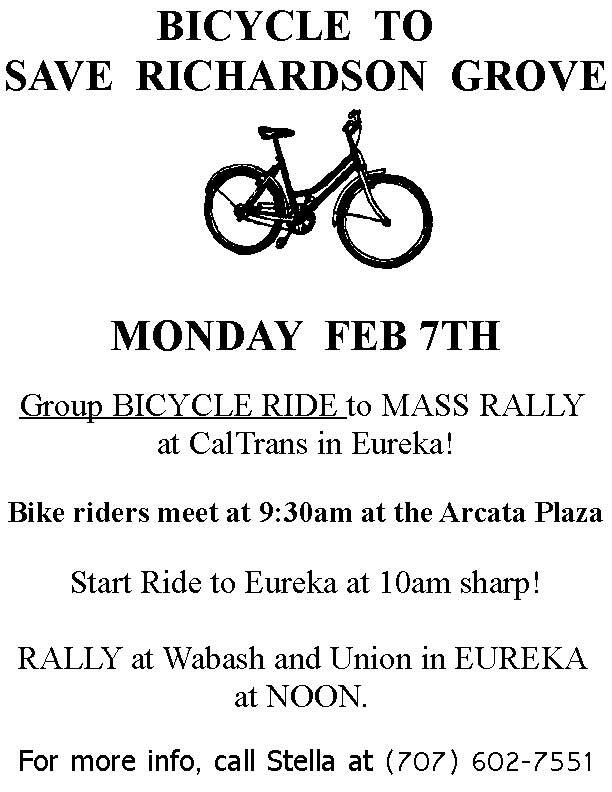 Start ride to Eureka at 10am sharp! RALLY at Wabash and Union in Eureka at NOON. 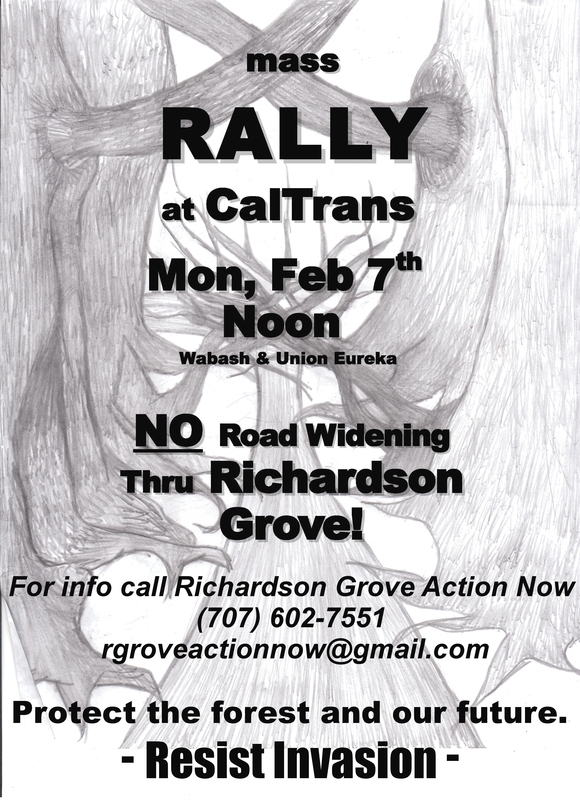 Mon, Feb 7th: RALLY at CalTrans, NO Highway Expansion Through Richardson Grove! 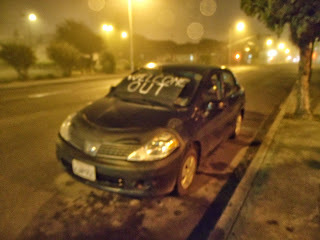 NO Highway Expansion THROUGH RICHARDSON GROVE! 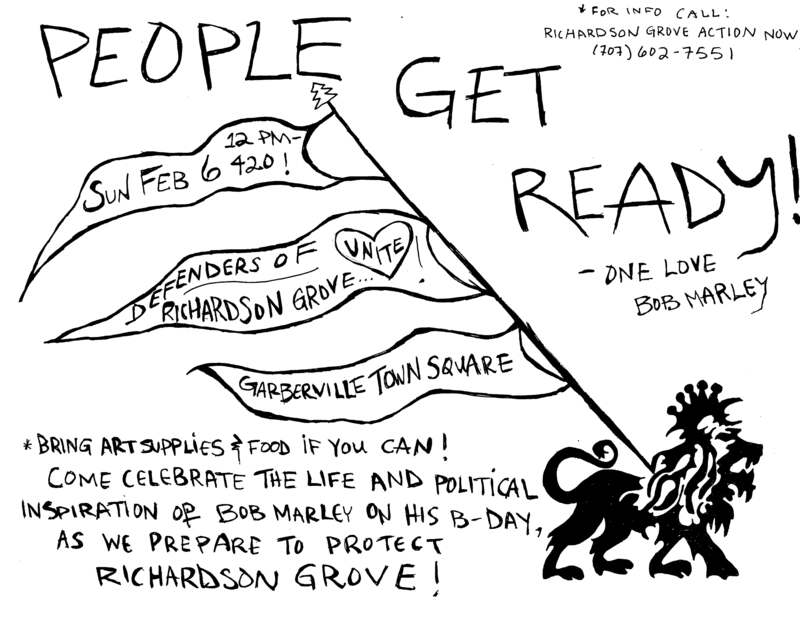 If you’re in Southern Humboldt, go to the Garberville Town Square at noon for Bob Marley’s birthday celebration and a craft-making event in preparation for Monday’s mass rally at Cal Trans District 1 Headquarters. Organize rideshares and rally spectacles!